During the workshop you will learn some jewellery making techniques including sawing, texturing, soldering and you will have the chance to make a pendant or earrings. The small class numbers will enable you to have lots of hands-on tutoring and guidance throughout the workshop and finish with a piece of jewellery you will be proud of. You will start by experimenting with copper and brass and create different textures, using hammers and punches. You can also try out other jewellery techniques: annealing, soldering, sawing, filing and sanding and then move on to design your piece, either continuing to work in copper/brass or use silver for an extra charge. All you need to bring is notebook and pen/pencil and an idea of a shape you would like to make into a piece of jewellery e.g. a heart, bird, leaf, flower etc. A small simple outline drawing is all that’s required. The cost is £45 which includes everything you need to produce your own piece of jewellery. All tools, equipment and tuition as well as tea and coffee are included. Silver sheet, chains and findings will be available to buy during the workshop at an additional charge depending on the size your require. 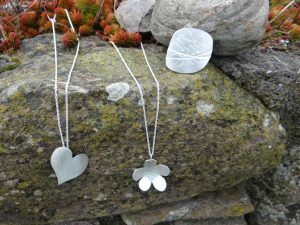 Silver for a pendant, for example would cost around £10 to £15.